While musing myself on themes suitable for a new post on my blog at least one subject offered itself last week in my mailbox. An antiquarian bookshop with stores in Brooklyn, NY and Stevenson, MD, sent me a message about nineteenth-century manuscripts for sale. One of the items attracted my attention because of a remarkable series of subjects touching on law, history and liberty brought together in a manuscript note by a well-known American author. Here I will try to focus on two questions which call out for an answer. Do these subjects really combine so easily and naturally as this author assumed? How can legal historians bring them into discussion again? Here I would like to share with you my first impressions. Magna-charta, jury-trial, habeas-corpus, star-chamber, ship-money, Popery, Plymouth-colony, American Revolution, are all questions involving a yeoman’s right to his dinner, and, except as touching that, would not have lashed the British nation to rage and revolt. Emerson had studied theology at Harvard. He had visited England in 1833 and 1847, and France in 1848 during the year of revolutions all over the European continent. My first impression of this sentence from the chapter “Ability” of English Traits is that of someone applauding the steady character of the British who do not let them foil into violent actions for some goal, however lofty or urgent. The Glorious Revolution of 1688, revolts in medieval England, the break with Scotland and the Dissolution of the Monasteries are conspicuously absent, and I choose here only a few themes. Instead of character I should perhaps say “nature”, taking the lead from Emerson’s famous essay Nature (1836/1849). In his even more famous address The American Scholar (1837) he urged writers to break away from literary conventions and to find their own voice. Some twenty years later love for things British seemed to be very real. Emerson definitely wrote in the century of the nation-state, and his opinions might be both fired and coloured by feelings of national pride, influenced also by personal experiences. His use of the words Saxon and Scandinavian race is distinctively mainly for the apparent conviction it carries, and not only for its factual imprecision. To all appearances Emerson shared here a Whig view of British history, one long and unbroken road to liberty. Emerson was a poet, too, and we should acknowledge that his vision of the United Kingdom is visionary, perhaps even utopic. Historical facts or their reassessment do not alter the poetic view expressed by Emerson. For a first online orientation concerning Emerson the article in the Stanford Encyclopedia of Philosophy is very helpful. You can execute illuminating textual searches in Emerson’s writings in the digital edition created by the University of Michigan, and continue your research at RWE.org. The nature of this blog post is a very simple first impression, a first look at a resource which surely can be studied in more depth. 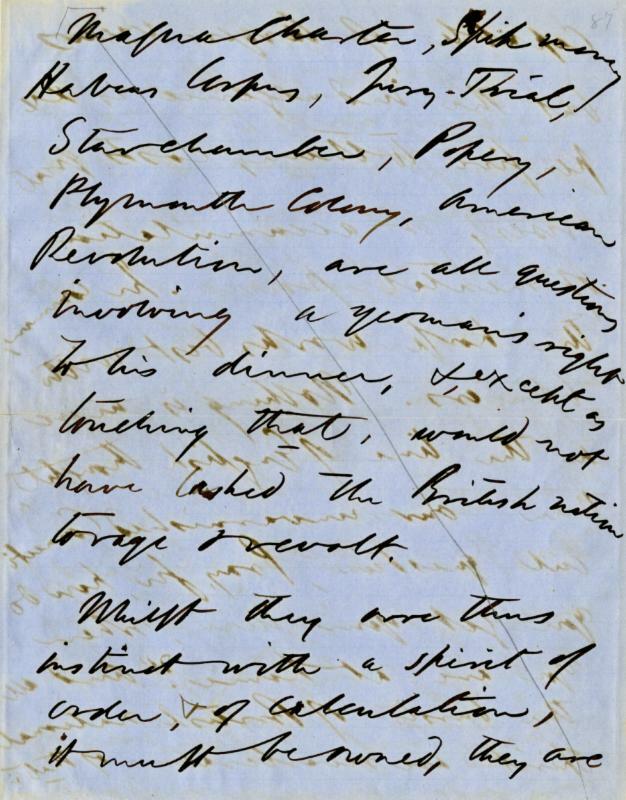 The core of Emerson’s note to be discussed here is the combination of familiar subjects for legal historians: Magna Carta, the trial jury, the Habeas corpus rule, the Star Chamber, the Plymouth colony and the American Revolution. In the image above you can spot that the ship money figured immediately after Magna Carta, but in the published text it has been moved to a fifth place. The fight against Catholic influences and the creation of the Anglican Church is concisely evoked by the word “popery”. The ship-money was the tax levied by Charles I of England between 1629 and 1640 without parliamentary consent. Once upon a time such subjects might have been included at least in continental capita selecta lectures about British history, but they more probably were and are at the heart of an introductory course in British legal history taught anywhere in the Anglo-American world. By the way, law is not forgotten among the digital resources presented at The Plymouth Colony Archive. Next year legal historians will face the celebrations around 800 years Magna Carta. The original copies will be shown in exhibitions, sometimes far from their present location. Cultural institutions such as the British Library will rightfully exhaust themselves to show their treasures and to appraise them anew. Hopefully historians can take a distance from preconceived opinions and look at their own prejudices, and help explaining how and why some themes in legal history gained their iconic importance. The thing that struck me most about Emerson’s words is the vitality of history and the value attached to it, even when admittedly the nineteenth century was the century of history par excellence. The two pages with his notes show in a very immediate way – notice the fluency of his hand! – how he saw himself as part of a living continuity. Whatever the reasons behind the American Revolution it followed nevertheless the example of a country with a long experience of institutions safeguarding liberty. The website of the antiquarian firm gives a five number amount of money as the prize of Emerson’s note. The prize of liberty and the just course of law and justice is beyond any prize. Legal historians should honour the history of liberty by pointing to its prime examples, to the grave and grim periods and events threatening liberty, to mistakes and opportunities recognisable in our days, too. This entry was posted in Catalogs, Manuscripts and tagged Law and Humanities, Legal history, Literature, Social history, United Kingdom, United States of America on June 30, 2014 by rechtsgeschiedenis.